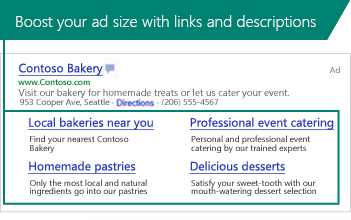 With new enhancements to Bing Ads Sitelinks, you can boost your ad size by adding two lines of customizable, descriptive text to each sitelink. A larger, informative ad means more attention from users. Sitelink Extensions are free to activate and include in your ads. The cost per click is the same as clicks on an ad title or URL.